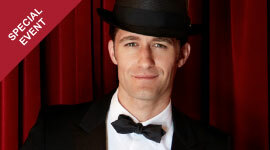 Bay Area Cabaret opens its 15th season with a show celebrating Matthew Morrison's twenty years on stage and screen. A native of Northern California, Morrison is best known as “Mr. Schuester”, the director of the glee club in Fox’s musical comedy series Glee, which received the Golden Globe award for Best Television Series – Comedy or Musical, in 2010 and 2011. Recently, Morrison received two Drama Desk nominations for his starring role as "J.M. Barrie" in the Broadway musical Finding Neverland. He made his debut on Broadway in Footloose, but his big break came when he was cast as heartthrob “Link Larkin” in the hit Hairspray. Morrison was later nominated for a Tony Award for his role in The Light in the Piazza, earned a Drama Desk Nomination for Outstanding Actor in a Musical for 10 Million Miles and gave a compelling performance in Lincoln Center’s Tony-winning revival of South Pacific. On PBS, Morrison hosted and narrated the special entitled Oscar Hammerstein II- Out of My Dreams, which focused on the Broadway producer’s life and career. Morrison starred with Cameron Diaz in the film What to Expect When You’re Expecting, and guest starred in The Good Wife and Grey’s Anatomy. His latest studio album, Where It All Began, is a love letter to Broadway.